The bodyCushion is the most versatile and comfortable pregnancy massage pillow out there! And it is not just for pregnancy massage anymore. It has become a massage supply must! 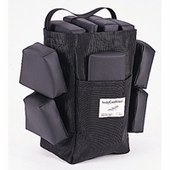 Add the bodyCushion to your massage table and ALL your clients...male, female, pregnant or not, will thank you for it!